The girls have arrived!!! Parker June and Zoe Jane were born January 16th, 2014. Unfortunately the girls have been at two different hospitals since the day they were born. During Jen's pregnancy, we were informed that Zoe will be born with a heart defect, Transposition of the great arteries. It has been a rough road for Zoe in the weeks leading up to surgery. 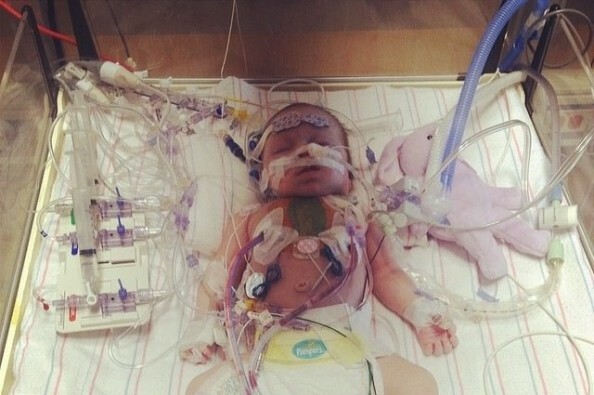 She had a disease in her intestines and a blood clot in her aorta. Thankfully doctors were able to get it under control and proceed with the Arterial Switch surgery on Wednesday, February 19th. Although the surgery went good, there is STILL a long road to recovery. We are forever grateful for all of the help weve had from our generous donors this far. We are currently starting to face the terrifying and endless amount of medical bills and needing your support more than ever. Thank you again for all your love, support, prayers and generosity. Its because of you we continue to stay hopeful. Thank you so very much for all your donations. Even though we've reached our goal I'm so thrilled that we continue to exceed it! Everyone's generosity has blown me away and we could never thank you enough. Take that babie home . My son was diagnosed with a heart defect at 3 days and cancer at 4 months. My heart and prayers go out to you. I'm sending some positive energy your way. Good luck, sweet baby.